A nine-page peace plan proposed by Putin in mid-January could be the basis for the initiative the French and German leaders are coming to Moscow with, Western media reports. 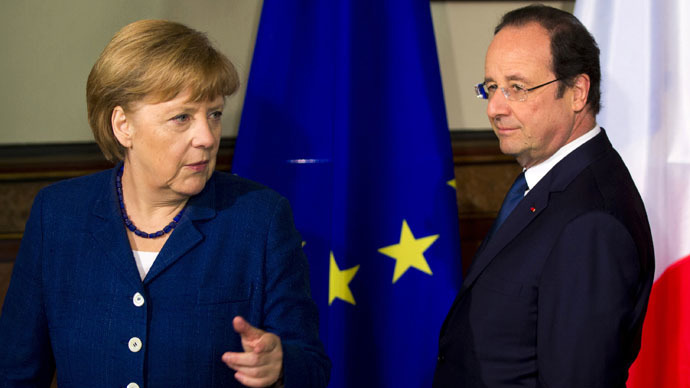 Angela Merkel and Francois Hollande reworked Putin’s peace plan having taken out suggestions the EU and Ukraine were most opposed to, Western diplomatic sources told AP. The new text is said to contain the promise of more autonomy for the rebel-held eastern Ukraine areas, and more protection for the Russian language and culture. Apart from more powers, the breakaway eastern Ukrainian regions could be offered extra territory, taking into account the land gains of 1,500 square kilometers (around 600 square miles) the rebels have made since the last peace agreement struck in Minsk in September, German newspaper Süddeutsche Zeitung reports, claiming knowledge of the plan’s details. German officials have, however, denied reports of offers of territorial concessions being part of the peace talks agenda. German Chancellor Angela Merkel and President Francois Hollande were in Kiev on Thursday and are now coming to Moscow in a surprise effort to come up with a solution to the Ukrainian crisis. The details of the initiative have not been officially disclosed. Hollande and Merkel’s unexpected push for peace coincided with the US secretary of state’s visit to Kiev. John Kerry had possible weapons supplies on his agenda. While he said the simultaneous visits of the three leaders were a sign of their unified stance on Ukraine, Brian Becker, director of Anti-War Answer Coalition believes otherwise. On Thursday John Kerry didn’t exclude the possibility of the US supplying Kiev with lethal weapons. "The president is reviewing all of his options, among those options is the possibility of providing defensive systems to Ukraine," Kerry told journalists. European defense ministers that same day spoke clearly against sending weapons to Ukraine. The term "defensive weapons," used by Kiev and Washington is a misleading one, according political analyst, Chris Bambery. Ukrainian Prime Minister Arseny Yatsenyuk, who met Kerry on Thursday evening, vigorously insisted there were Russian troops fighting in the self-proclaimed Donetsk and Lugansk people’s republics. His assertion echoed Kerry’s earlier allegations of “Russian soldiers and Russian tanks” crossing the border with Ukraine. "It seems to me the only country that strongly denies there are Russian boots on the ground is the Russian Federation and President Putin," Yatsenyuk said, according to Reuters. "If they need it, I can give them my glasses. We are not fighting with so-called rebels or guerrillas, we are fighting the Russian regular army." However, both Kerry’s and Yatsenyuk’s statements contradict last week’s statement by Ukraine’s military chief of staff Viktor Muzhenko. “We are not militarily engaged with any regular forces of the Russian federation,” he said. Moscow has asked in vain for evidence of it being militarily involved in the conflict and has blamed the West for making unfounded accusations.